I can’t believe how fast this summer has flown by and how much fun I’ve had. It’s weird to think that I won’t have to go back to school this fall, but I’m looking forward to continuing my free time. My parents were all set to go on our annual end-of-summer trip to Lake Havasu in Arizona. 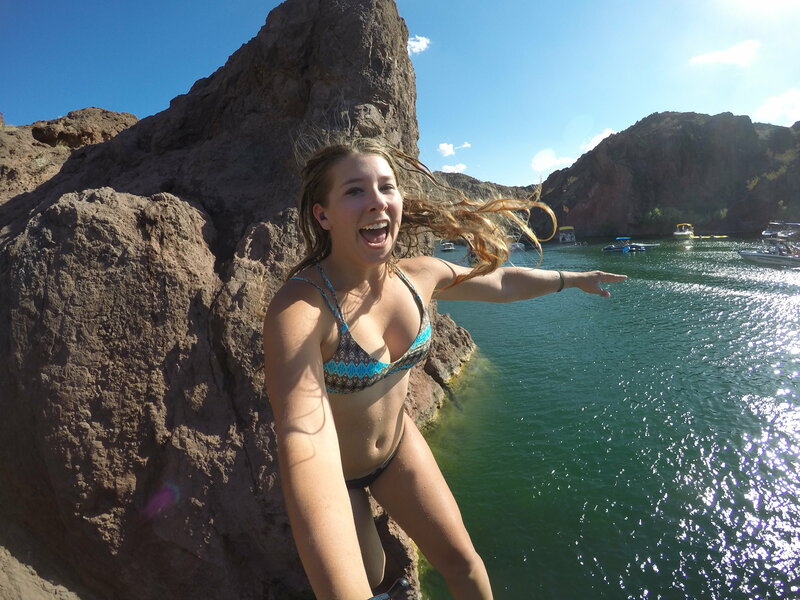 85 degree waters, wakeboarding, tubing, rock jumping, bikinis…I’M SOLD. By some miracle I was able to get all my shifts covered at work so we packed up our boat and headed across the state for a couple days. Taking in the sunset from the water. 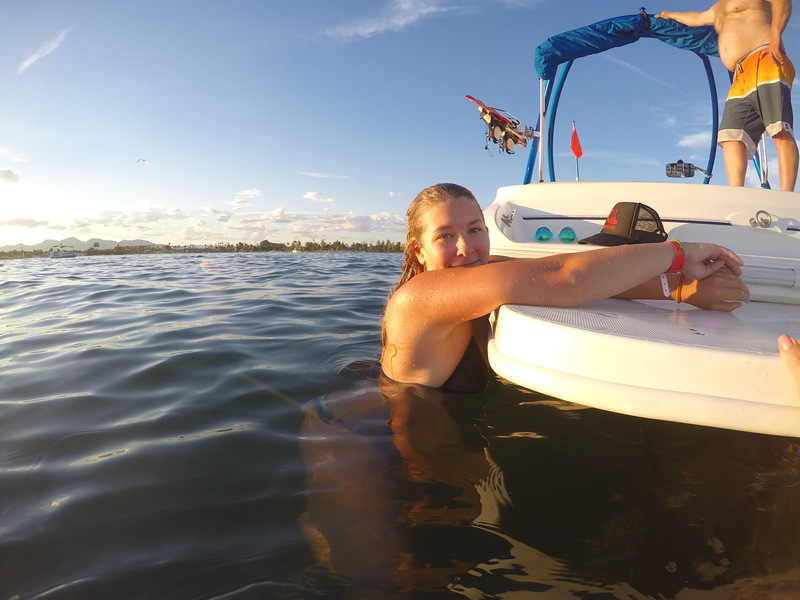 One of the best things about Havasu is really the amount of activities you can do on just one lake. The first day was spent just relaxing around our friend’s vacation house rental which comes complete with an infinity pool overlooking the valley, game room, movie room and overall perfection. After getting out early on the lake the next day, we took advantage of the calm waters to do some wakeboarding and tubing. A couple beers later, we jetted to the other side of the lake toward sand bar and Pirate’s Cove (aka the best lake-side bar on the water). Water activities at Lake Havasu. 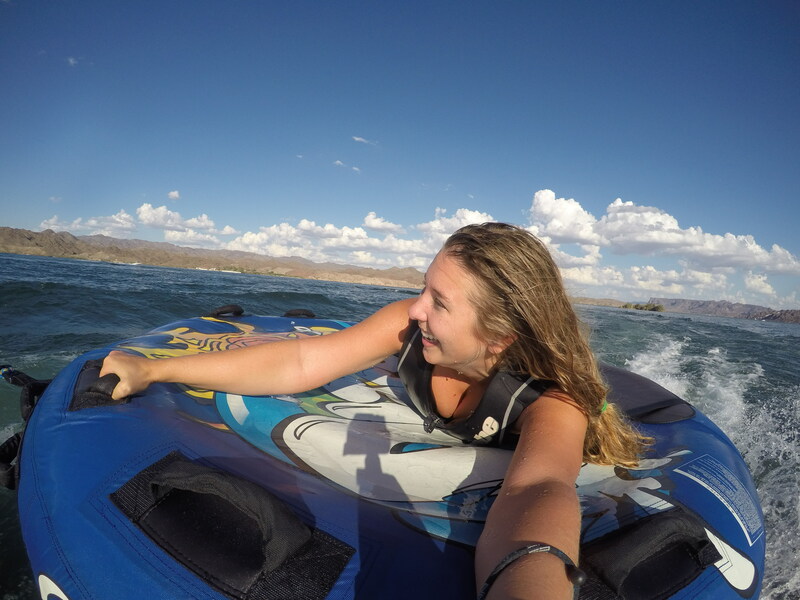 My favorite thing about Havasu has to be the warm water. Even though it’s not exactly refreshing to jump into 85 degree water when it’s already 110+ degrees outside, it definitely comes in handy when the sun is setting and you want to go for a little dip. In just the four days we were at the lake, each sunset was breathtaking in its own way. Watching it from the water while sitting on a floaty and drinking a beer was the perfect way to end our long days. Taking in the perfect sunset. Our last day had one important item on the agenda: rock jumping. Copper Canyon is the most popular spot on the lake thanks to its variety of ‘rock sizes’, with everything from a small boulder to a towering rock cliff. Personally, I’ve only jumped off the medium sized rock, but maybe one day I’ll grow a big enough pair to go big or go home. One thing I can not stress enough is ear plugs. They have saved me so many times not only rock jumping, but when I’m flying off the inner tube at 25 mph. Jumping off rocks at Copper Canyon. Overall, Havasu was a great last trip to end my summer with. Even though it was a little tough to compare after just getting back from Hawaii, it’s nice to be able to go somewhere that all you need is a bikini and some pjs.